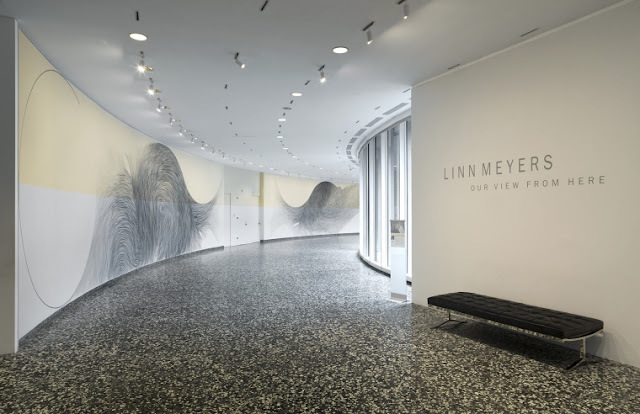 Linn Meyer's wonderful wall drawing/show at the Hirshhorn, Our View From Here closes on August 13! After that date, the drawing will be painted over and the piece will vanish. If you haven't yet seen it, I hope you will visit the Hirshhorn before the exhibition is over. There have been several articles written about the show. If you're curious to read more, check out: Smithsonian Magazine, The Washington Times, Hyperallergic, The Washington Post, and Bmore Art. More information on the exhibit can be found on the museum's website here.